In Venezuela, An Abduction Highlights A Scourge Washington Nationals catcher Wilson Ramos' kidnapping had a storybook finish when commandos rescued him just two days after he was abducted. But others aren't so lucky. It's not uncommon for hostages to die in Venezuela, and the usual path to freedom involves paying a big ransom. 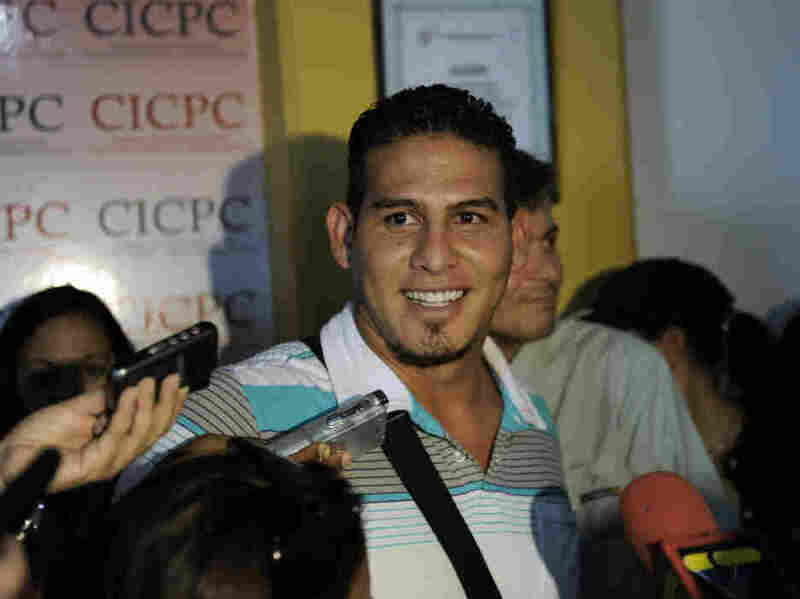 Washington Nationals catcher Wilson Ramos, seen here at a news conference on Saturday, has much to smile about: He was rescued just two days after he was kidnapped. Not all Venezuelans are that lucky. The government's own statistics show that 895 kidnappings were reported last year. Wilson Ramos came home to a hero's welcome in Valencia, Venezuela, to neighbors celebrating his rescue by commandoes just two days after the Washington Nationals catcher was abducted. His mother wrapped her arms around him, crying, "How good God is." It ended happily for Ramos, who was in the country to play in the Venezuelan winter league. But it's not uncommon for hostages to die in Venezuela, and the usual path to freedom involves paying a big ransom. The government's own statistics show that 895 kidnappings were reported last year — 20 times the number recorded 13 years ago, when President Hugo Chavez first came to power. Many Venezuelans say there's no end in sight. Manuel Heredia, president of Venezuela's cattlemen's association, says there was a time when kidnappings mostly took place along the border with once-lawless Colombia. "Now it's storekeepers, engineers, housewives, students," Heredia says. Alvaro Ochoa, a young professional in Caracas, was carjacked and held until his parents paid a ransom. He says the kidnapping was traumatic; he couldn't be sure he'd come out alive. The kidnappings are a problem for the Chavez administration. Polls show crime is a top concern for Venezuelans. So Ramos' rescue was welcome news for the government. Justice Minister Tareck El Aissami celebrated at a news conference what he called brave officials who risk their lives to rescue others. In Ramos' case, the rescue came with a shootout, the ballplayer recounted in an interview just minutes after he came home. "There was a lot of gunfire," he said on Saturday. "I got under the bed, prayed and cried." He said the rescue was like something out of a movie. "If it hadn't been for the authorities," Ramos said, "I don't know what would have happened to me." And then he turned to well-wishers to thank them and to tell them he loved them.